How do you build cities or even a single house on Mars when you don’t have access to the construction materials we enjoy on Earth? That’s the dilemma NASA put to 18 international design teams in the 3-D Printed Habitat Challenge. Their task was to design a virtual model of 3-D printed houses, which would be built ready for the arrival of astronauts on the red planet. The Habitat Challenge - which has been running since 2015 - has three phases, each with multiple levels. Phase One was the design competition. Phase two focused on material technologies, requiring teams to create structural components. They’ve both been completed. The competition’s now in its third, final and most difficult phase. Teams are challenged to fabricate sub-scale habitats. There are five levels of competition – three construction levels and two virtual levels. For the virtual levels, teams must use Building Information Modelling software to design a habitat that combines allowances for both the structure and systems it must contain. 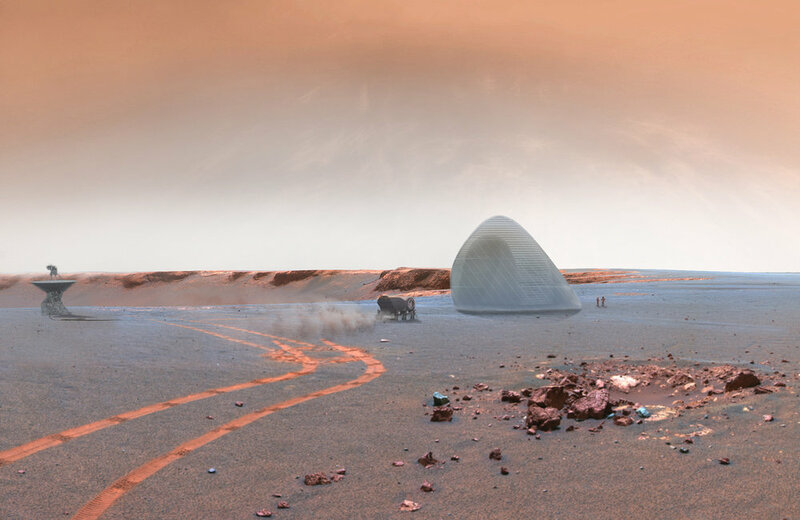 The construction levels challenge the teams to autonomously 3D-print elements of the habitat, culminating with a one-third-scale printed habitat for the final level. There’s a total prize pool of $3 million on offer. NASA is running a design competition to develop a 3-D model for a structure on Mars. Obviously problems other than housing need to also be solved for these micro villages. Visitors to Mars will need a power source, such as solar panels. They’ll need fuel for the return flight, and they’ll need roads so materials can be moved around safely. The 3-D Mars Ice House competition is in the third of three phases. Mars will be a challenging construction site. It’s dusty, cold and corrosive. And what if spare parts or extra materials are needed? A quick trip to Mitre 10 or Bunnings is out of the question. It’s not even like popping back from the moon - Mars is months away. Water ice is plentiful in some areas on Mars and is an excellent cosmic ray shielding material. NASA says it hopes that some of the technology and ideas developed through this competition can be used to produce affordable housing on Earth. More than 165 submissions were received for phase one of the competition. First place went to Team Space Exploration Architecture and Clouds Architecture Office for their design, Mars Ice House. It features a large inflatable torus, a shape similar to an inner tube, that is surrounded by a shell of water ice. 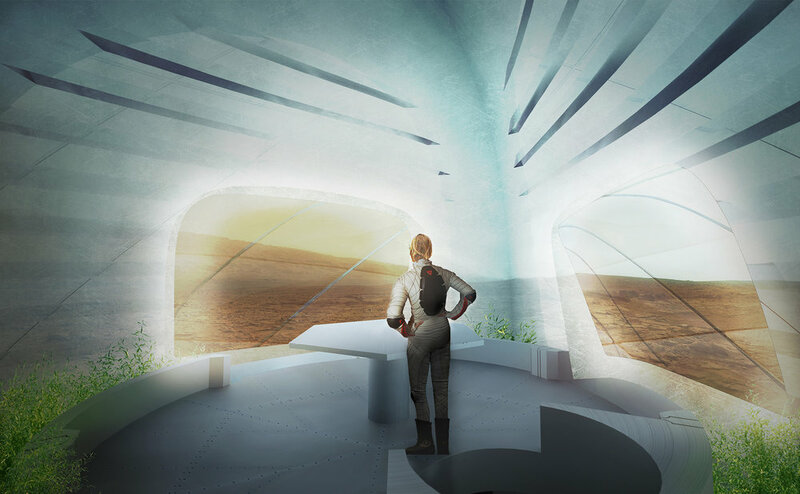 The Mars Ice Home design has several advantages, judges said, that make it an appealing concept. It is lightweight and can be transported and deployed with simple robotics, then filled with water before the crew arrives. It incorporates materials extracted from Mars, and because water in the Ice Home could potentially be converted to rocket fuel for the Mars Ascent Vehicle, the structure itself doubles as a storage tank that can be refilled for the next crew. Another critical benefit is that water, a hydrogen-rich material, is an excellent shielding material for galactic cosmic rays - and many areas of Mars have abundant water ice just below the surface. NASA hopes some of the technologies developed in its competition could be used to create accommodation on Earth. Galactic cosmic rays are one of the biggest risks of long stays on Mars. This high-energy radiation can pass right through the skin, damaging cells or DNA along the way that can mean an increased risk for cancer later in life or, at its worst, acute radiation sickness. The translucent walls of the Mars Ice House let light in for the inhabitants. Vertically growing hydroponic gardens serve as the recreational ‘parks’ within the habitat, disrupting the alien monotony of Mars’ landscape while also supplementing the crew’s food and oxygen.